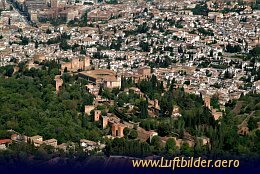 The Alhambra is a fortress complex of the Moorish monarchs of Granada. Moorish poets describe it as a ''pearl set in emeralds'' in allusion to the brilliant colour of the buildings and the wood around them. The park was planted by the Moors with roses, oranges and myrtles.